I feel so terrible for neglecting my blog! I apologize for my lengthy hiatus from updating how things are going. Things have been hectic, even for us. Plus, I forgot – amongst other things – to pack my laptop charger so my mother-in-law had to ship us a few items and I’ve been anxiously tapping my foot waiting to finally update this blog! For starters, the Walking the Walk for Drew 5K was a hit and exceeded my expectations! The event went off without a hitch and we managed to bring in over 120 runners and walkers, about 40 more than the maximum I had anticipated. And, we raised $5,160! It was a lot of fun even though it was very hot! I bet an hour didn’t pass between us unloading the truck and then visiting the pool! Shortly after the event, we started our trek back down to West Palm Beach in anticipation for Drew’s 6th and hopefully final leg surgery scheduled for June 3rd. The trip was great despite our fears that my late pregnancy would abruptly surprise us with unexpected labor mid-trip. I managed to stay somewhat comfortable (even drove a lot of the way) and our frequent stops I was ordered to make to avoid complications didn’t slow us down as much as we feared. We made it with our sanity intact and it was actually nice to be back. 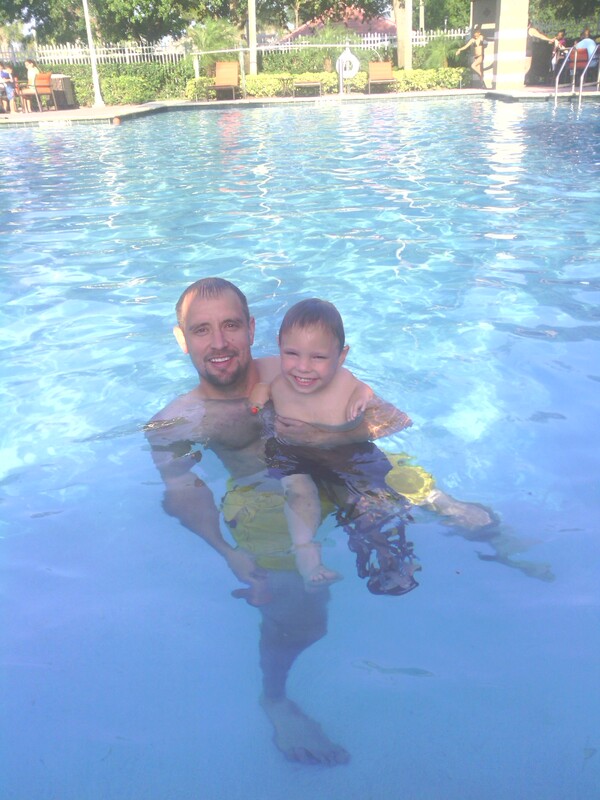 The weather is gorgeous, the pools are open and our apartment was mold-free this time! For some reason, Nathan and I have found ourselves incredibly bored, at the brink of insanity and we can’t figure out why. It’s not that we would have anything exciting to do if we were back in Kentucky. And, seeing as Drew has a surgery and a complicated cast on the horizon, not to mention the fact that a newborn baby will make his appearance shortly after, you’d think we’d be reveling in our lazy days. But, we’re not. Maybe it’s because we’re suddenly living in a more confined space, less than half of our square footage at our house or maybe it’s because we miss everybody at home so much already. But, the weekend druuuuuuuuuuuuuug on. I was actually anticipating the onslaught of doctor appointments, both for Drew and myself, during the week. Today, Drew had his first therapy session back at the Paley Institute since his femur was fractured back in January. We were especially excited to take the opportunity to have Drew walk in his gait trainer from the truck into the office like most other kids do. Previously, we toted Drew in his wagon and occasionally in his wheelchair longingly watching other kids Drew’s age walk and I always anticipated the moment that that would be us, sometimes questioning if it ever would be. 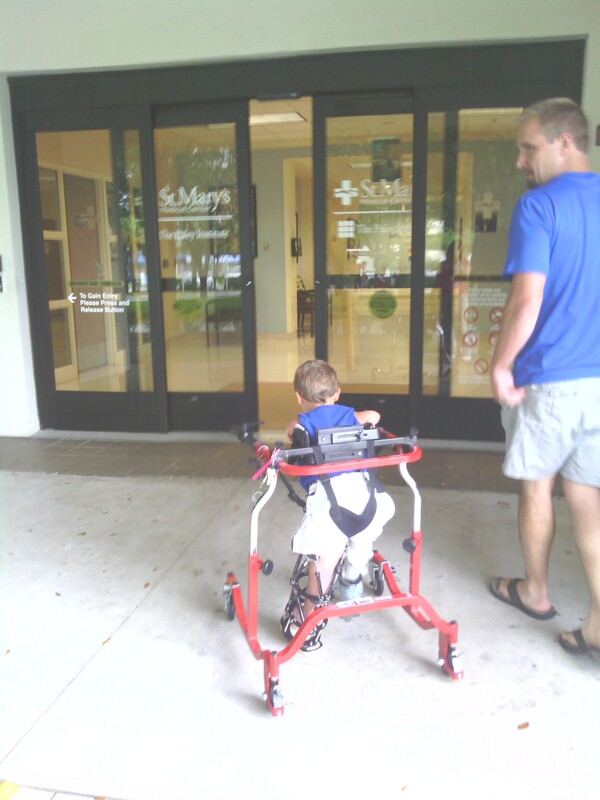 It was so emotional watching Drew walk in the doors and down the hallway to the therapy department. I anxiously looked around for someone – anyone – who knew Drew so they could share in this moment. It wasn’t long before some familiar members of the staff spied us and came to welcome us back and, of course, seeing Drew walking was shocking and a joy. As we walked into the therapy gym, all of the therapists, each of them having worked with Drew at some point, stopped what they were doing to congratulate and ooh-and-ah at how grown up and strong Drew has become since our last visit. I was nearly in tears as pride beamed through every pore. I was so happy to finally be one of those families that walked in. We have accomplished so much. We’ve made it so far. We’ve come from the lowest of lows and finally made it here alive, healthy and strong. Thinking back on our painful, stressful and desperate year it finally feels like it was all worth it. The light at the end of the tunnel is finally upon us. And, I’m sure we’ve done the right thing. Drew with a therapist, Fran, working on his knee flexion. Drew did great during therapy showing off his new moves and strength. Though PT here is a lot more intensive than PT back in Kentucky, Drew did his best to bare with it. I have to admit that we took it easy on Drew in Kentucky, probably a little too easy on him, after his femur was fractured and didn’t push him as far. But, now that we’re back at Paley’s, it’s back to the real deal. But, it’s a good thing. However, I had gotten used to PT being so easy-going (but still making tons of progress) back in Kentucky that it was hard having to watch Drew panic and sob in pain. I’m sure a lot of his discomfort was just fear of a femur-fracture repeat because he’s so anxious about bending his knee and it was being pushed farther than we had been pushing in Kentucky, but I know he was in some pain too and it’s so hard having to watch Drew go through it. Drew’s fixator removal surgery is Monday so I’ll be updating the Drew Walking Tall Facebook page with how things are going throughout the process so go ahead and visit and “like” the page if you want to keep up. I’ll blog about the day as soon as I’m able. I’m thinking it’s going to be out-patient surgery, but we won’t know for sure until Friday during pre-op. So, talk to you soon! Next Post Fixator Free Finally!